Yang’s wallpaper series is created in collaboration with a graphic designer. 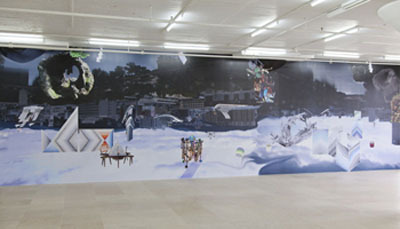 Her first wallpaper was Field of Teleportation (2011), produced for the exhibition The Art and Technique of Folding the Land (2011) at the Aspen Art Museum in the US. A variety of motifs including root carvings, work images and installation views are “teleported” away from their original hierarchy to form a new fantastical scene. The wallpaper itself is a hybrid of artworks and a series of artifacts, creating a diasporic space. The work invites the viewer into a supernatural surface where gravity, perspective, time and space unfold arbitrarily. Multiple Mourning Room, reproduced at Leeum, was Yang’s second collaboration with Berlin-based graphic designer Manuel Raeder and was shown previously at Greene Naftali, New York (2012) and at ICA Boston (2013). In it, various objects and works oscillate through space and time as they drift against a backdrop of a scene of Hiroshima in which the river and the sky are reversed. Images of light sculptures with their legs cut off, volcanic rocks from Jeju Island, Japanese grave sites, root carvings, details from Can Cosies (2010«2013) and Trustworthies, and furniture sculptures float free of both gravity and the logical connections between meanings. The individual elements deny conventional relationships, forming a scene evocative of wild, untamed feelings. They furthermore relate to the other works in the exhibition space, which reiterate the landscape.